You can always use Web-Based Email to send and receive email messages. But you also can view your email with an email client. 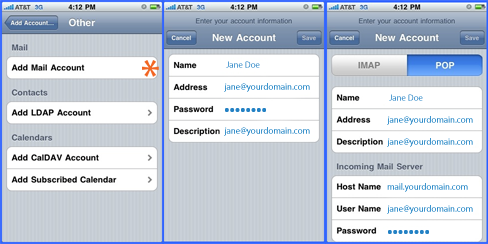 To access your email through an iPhone®, add an account with the settings outlined below. This article's screenshots use iPhone firmware 3.1.2, but previous versions use the same settings. NOTE: iPod Touch users may also use these settings, but must connect via Wi-Fi to send and receive email. Complete the following fields, and then tap, Save. NOTE: Some users should use IMAP (Smartermail). 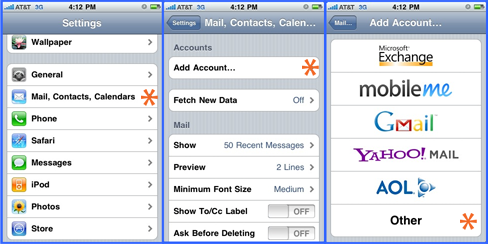 If you have trouble with POP please select the IMAP option. To use IMAP, your email account with us must support IMAP functionality. NOTE: As a courtesy, we provide information on the use of certain third-party products, but we do not endorse or directly support third-party products and we are not responsible for the functions or reliability of such products. iTunes®, iPhone® and iPod® are trademarks of Apple Inc., registered in the U.S. and other countries. All rights reserved. We are not affiliated with, endorsed or sponsored by Apple or Apple products.